I’m obsessed with macarons. They’re my favorite, absolutely favorite dessert. I first tasted them at Payard. It was love at first taste. My best memories of them were during my honeymoon in Paris. I swear we had them for lunch-dessert and then again for dinner-dessert. Everyone touts Laduree but you can get them anywhere in Paris and they’re swoon worthy. It’s not just the taste though. I think as a visual person I take macarons as a visual feast as well as a literal one. 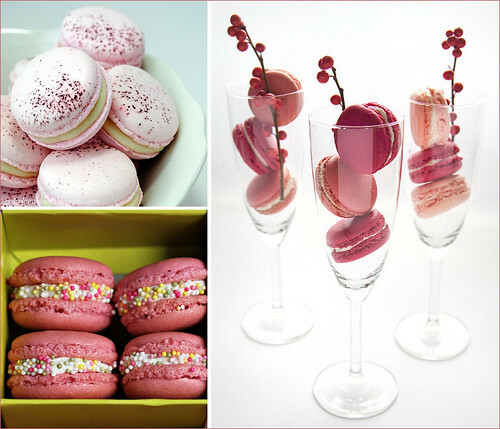 Check out Macaronage ( the source of the images above) for some enticing photos of dreamy, colorful, delicious macarons. These look delicious, loving the macaroon revival!